The scope of MBA in Marketing is very good in today’s market trend. MBA in Marketing is one of the oldest disciplines of management study. If you are interested in the entertainment, media, promotions, advertisement, sales and general management field, then the MBA is appropriate for you. The marketing is the heart of any organization. The trend of marketing has changed and augmented with the technological evolution in the world. Get Latest Career Notification about MBA in Marketing, by entering your details below. The MBA in marketing is involved in the sales and services of the products, competitions and market trends of the business. MBA in marketing educates the students about sales, marketing fields, executive and leadership management skills, consumer trends, market strategies, product management and market research in different industries. “MBA in Marketing Management is the subject of sales & services, promotions, advertising and consumer behavior study”. MBA is a 2 year degree programme. You can choose the one of your favorites and interested specialization out of the finance, marketing, HR, OM etc. 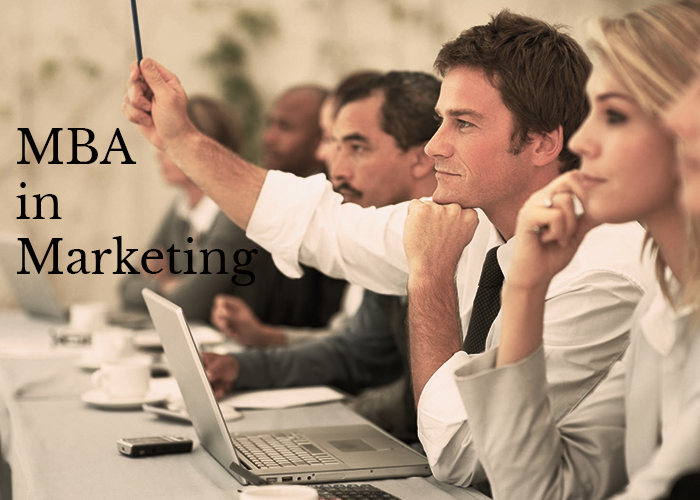 Marketing is one of the trending specializations of Master of Business Administration (MBA). Every year, a large number of students opt for MBA in Marketing across the country. To get the admission in MBA you should have a graduate degree in any discipline with good percentage. Here we are talking about one of the specializations called “Marketing”. You will also learn the communication skill, analytical skill, ability to integrate programmes or ideas, business ethics and leadership while your course ended. Which colleges are best for pursuing MBA with Marketing Specialization? You can pursue MBA in management from various B-schools situated in India as well as in abroad. It is best to do MBA in Marketing from IIMs. Apart from IIMs, we are also listing some good private colleges and Universities for pursuing this course. To get the admission in MBA with any specialization, it is necessary to appear and score in GMAT 2019/CMAT (Graduate Management Admission Test/ Combined Management Admission Test). You can do the MBA in finance after the completion of UG degree in Engineering, medical, science, art and humanities. Some of the affiliated universities conduct their own admission examination. Various states conducts its own entrance exams for providing admission to MBA programme. Yes, you can do the MBA in marketing through the distance learning education programme. Some of the universities like Sikkim Manipal University and Indira Gandhi National Open University are offering the distance MBA programme. Some of the Indian Universities do not hold the entrance test for online education. There is a good scope of MBA in Marketing. Marketing itself is a vast field. After doing MBA in marketing, candidate can become sales executive or manager in reputed Fast moving consumer goods (FMCG) companies like HUL or Marico industries. One can also work in IT industry. Job opportunities are also available in Retail, Tourism, Banking, Hospitality, Media, Advertising, Consultancy, Market Research, etc. With MBA degree in Marketing, candidates an also work as lecturer in prestigious institution. There are top rated B-schools in India which provides excellent salary to faculties. If you are interested in higher studies, then you can do Ph.D programme in related field. The students, who have done the MBA in marketing, have a lot of job opportunities in government and the private sector. You can be part of direct marketing or digital marketing. By the growing technology in the world the concept of marketing is not limited to the door to door sales. It has a wide variety of technologies. You can do the marketing by the social media, pay-per-click, web designing, search engine optimization, search media optimization and articles. The candidate having the MBA in marketing degree can earn the 40000 to 65000 per month in India. The salary structure depends on the position and reputation of the employer firm. For any queries regarding MBA in Marketing, you may leave your comments below. yes you can apply for these companies. I am doing b tech in agriculture but I don’t wanna study agri any more. Can I do MBA after graduation? I am studying these year in B.sc-Biology (3 year) , after completing these degree. Which branch in MBA., for me is better, i am week in maths, please suggest me. Hi I am Rahul srivastav from Guwahati Assam i have completed my MBA from NIBM in the year 2015 in marketing and Brand managment .please suggest me were i will get good job …. Yes you can. this is a good course. Since you’ve completed your M.Tech in Biotechnology, so i think you should go for research in your field, Biotechnology has good scope in Research. I am in second year bcom and studying in Mumbai. I wanted to ask you that is Mba in digital marketing having scope in future? If yes, where should I do it from, which college? What will be the pay package? it has a good scope today and in future. The salary is depend on the employer and your skills. Any B-school over India offer the MBA in DM and this is counted as a full MBA of the duration of two years. I have recently completed my Btech in civil enginnering and i am further interested to study MBA sir can you suggest me the courses apart from civil field which will be good from future prospective point of view and which stream in management covers broader area or discipline to do the job ?? I have done b.com and nw I am pursing mba 1st year from kuk. I want to ask you tht which stream will be better for me in mba…. and is it scope in india tht I do?????????????? Nd i want to do mba.. Plz suggest mee best field in mba xcept finance. Is dere any scope for girls if dey opt mba in marketing? I do have interest in dat or shuld i opt for mba in HR….? MHA HR suit to your UG course. I am doing my B.com from Delhi University. I would like an MBA but i don’ know in which field. Personally, i think a marketing profile matches my abilities but i have heard it is an intensively travel based job. Could you please how do i decide my career goals? Also, is there any personality in marketing or finance whom i can search on Linkedin? I have done b-pharmacy..plz suggest me…. I am a mechanical engineer and got placed in a valve MNC as technical sales engineer. If I go for MBA in marketing may be after 2 years of job experience , how will it help me. Whats the scope of MBA marketing in india. Will it be OK if I do MBA marketing by distance learning program .which are best college for same ? I hope you will give me best instruction for my query. you should work on your communication skills, marketing professional must have a good comm skills. You should also prepare for admission to the top MBA colleges through CAT, MAT. what specialization you wish to choose in MBA? both fields are good you can choose any one of them. If not how can I study it(digital marketing)it seperately.. Yes you can pick digital marketing along with your current stream. yes you can pursue MBA in hospital management. I doesnt want to do a direct marketing as i hate thiss field so pls u gve me any best option after doing MBA mktg…..
Is MBA Marketing a good scope after BTech in ECE? What are the scopes? Why one wish to spoil his/her engineering degree. i have done mba in marketing what is best career option for me. i am doing BE in information science and field of MBA is good for me? You can apply for MAT, CAT for admission to MBA colleges…in your preferred branch. Construction or infrastructure or project management. I hv keen intrst in event mngmnt…puzzle tell me abut its scope and expctd earnings..I wanna earn alot..do this field will help me so..plzz reply..
you can pursue any MBA field as per your interest, but as per you field MBA in Hospital management will be good for you. digital marketing is the best for future and these days also. offline marketing or the traditional marketing is now falling and replaced by the digital marketing. sir i m a pcm student and i m nt interested in btech m interested in business which course i do after 12th.. I am a commerce student just finished with 12th boards & confused for choosing a better job oriented career option.I hav a keen interest in business pls guide me. Complete you graduation and then apply for MBA etc. i m pursuing mba in finance and marketing from lko clg. Do I have a good scope as. Do my college reputation matters while interview. In finance and marketing which have more scope..?? college reputation matters and finance is the best field. Then you will receive a score card having your GMAT score..by which you can apply for admission in various management schools situated abroad. Hi, i am doing MBA and have to choose a specialization either in marketing or finance. I want to take marketing but they say there is higher scope in finance and marketing involves only field to field selling. DO i have any chance of getting a more worthy job if i take marketing? Yes you can, marketing is not only the door to door marketing. today the scenario has been changed digital and online marketing replaced the D 2 D marketing. it has really a good scope. I have done my B.tech (c.s.e.). I got a above average percentile in that. Now i am pursuing my mba from distance education. I am confused to select a mba program for the secnd yr.
Pls Help in choosing a stream and tell about my job prospects in india and expected salary. P.s. i have no work eperience and i have joined mba right after my btech. I have done graduation in tourism management. now i want to do MBA…but little confused about the specialization in hr or marketing..which will be good fr me..
anyone of these will be OK for you. i am abhishek mai MBA kerna chahta hun koun se subject se karoon please mujhe advise de ? I am a commerce student. Right now i am in fy b.com. I’m interested in MBA but dont want study more after b.com. Can you suggest me some job oriented courses besides CA and CS???? In any course you will have to pay your time and study then why not MBA? Because MBA is a full time course.. I can not do any part job with MBA.. Experience is necessary nowadays so i want to study such type of course which give me enough time for job.. I have selected HRM as specialised subject..To become a HR manager from where i should start? I mean what will be the 1st position to reach HR manager post?? set your goal, make your road map, achieve your target and sustain your study. yes of course, you can pursue part time MBA, in retail or in operations that will open more opportunities for you in near future. I have done B.Com and taken Admission in M.B.A. I am confused about which field should I choose between Marketing & HR ? Just get the admission first. In third semester you will have to choose the specialization and till than you will recognize your interest. Some of the hot MBA field are IB, Logistics, Digital Marketing, IT, Energy etc. If you join a good college than the chances of placement will be much higher. I am doing B.sc and wanted to do MBA and also i wanted to join my family bussiness . so plaese help for which branch is helpful for me in MBA. You can appear for MBA finance, MBA retail etc. i have done my bhm(2012).got experience in hr want to go into finance.but as i have no knowledge about commerce.can i do mba-finance bcz after hr finance is the domain which has more job secruity & stability than marketing.while my background affect while interview even though after having good knowledge. Yes there requires the good grip over commerce for finance management. But as you told me that you have done the BHM so i think there will not be any issue in your case. I havec done my indermediate exam from science and math can i do mba?is it better for me? I am B.TECH. in Mechanical, want to do MBA in Marketing & wish to have a job in Automobile Company…. 1)How will MBA help me after engg? 2) If Automobile sector don’t recruit Marketing MBA, than what is the nearest Technical Company option I have? Marketing has good scope and always been a trendy field, but as you are a M.E. graduate and want to go in automotive sector, then i think MBA (operations) will be better for you, also you can do your MBA from a specialized branch like logistics, port and shipping management, or oil and gas marketing. I am doing eng hons from delhi university.. and i want to do mba after my graduation.. can u plz suggest me what subject is better for me..?? i a in my 2nd year commerce is MBA for me a best opion,i thought doing bca and mca but my teachers said me chose BBA and MBA,can i….? See where you are interested, BCA and BBA are totally different fields. If you are interested in computer and programming than BCA can be a good option for you, but if you are interested in business than BBA and MBA will provide more opportunities for you. Hi..im in 12th and interested in event management so what courses should i take after 12th? Do the BBA and them MBA in event management. u should me bba from a best university tht’s better for you…. I had done my +2 with PCB and doing bsc hons botany in Delhi university but I don’t want to do my further studies in botany. Can I do MBA? And which field is good for me? Yes you can do integrated 5 year MBA. you have an appropriate education and after that you may get your field job. Appear for Management exam like CAT, MAT and also the the other entrance exam conducted by various universities in India. After clearing the exam with good percentile you will be eligible for admission in the MBA courses. I am confused between finance and marketng so plz suggest and who have betr scope in future plzzz help me out?? Finance is good but if you are going towards the digital marketing then no stream can beat this in future. See, the recruiters will focus on your potential for the particular job. your academia can be a booster for your employment but not at all. In management field you should have caliber and leadership. if you posse those things then you may get the job. I am doing distance learning course PGDBA in marketing subject form Symbiosis and also doing job in insurance industry. I have started this study to boost my career but now i am not focusing in study due to job timings. So kindly suggest what i need to do? hii..i am doing mba with major specialisation Marketing.i have done my graduation in BE(computer engineering).so what is scope of my educational background in marketing organizations. yes marketing is a good field, especially digital marketing being a CS graduate the scope of digital marketing is huge.